I am a momma who loves spicy! Chicken with hot sauce has always been one of my favorites. 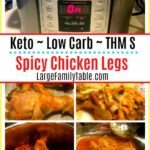 Now, believe it not, the full hot and spicey flavor comes out pretty mild in these low carb Keto Spicy Chicken Legs. For my large family that means that even though this is a spicy recipe, several of my kids gobble it right up! 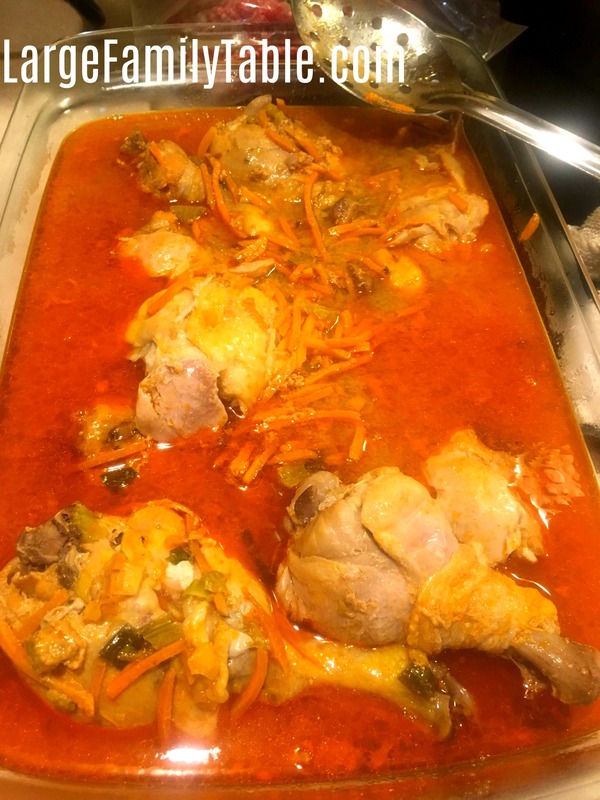 I made four 4lb bags of this Spicy Chicken Leg freezer meal recipe on my last freezer cooking day where I made 50 Keto Low Carb Large Family Instant Pot Freezer Meals. I kept two bags to fill my family freezer and shared two bags with another large family mom friend. Since I like to turn many of these easy freezer meal recipes into Instant Pot freezer meals as well I used the quick cold water defrost method. You see, I can’t open my frozen gallon freezer meal bag and have all the frozen ingredients dump out into my pressure cooker. I have to loosen up the bag ingredients first. I safely defrost my freezer meal for just a few minutes in a bowl of cold water. This allows the meal componets to loosen from the sides of the freezer bag. In just a few minutes (up to 15 minutes from my experience) I’m able to dump the contents from the gallon freezer bag into the Instant Pot. There are sites online that share to use plastic tubs for your Instant Pot freezer meals. I have found that I can’t always fit all I need in those tubs, plus I can’t always store them as easily in my freezers. 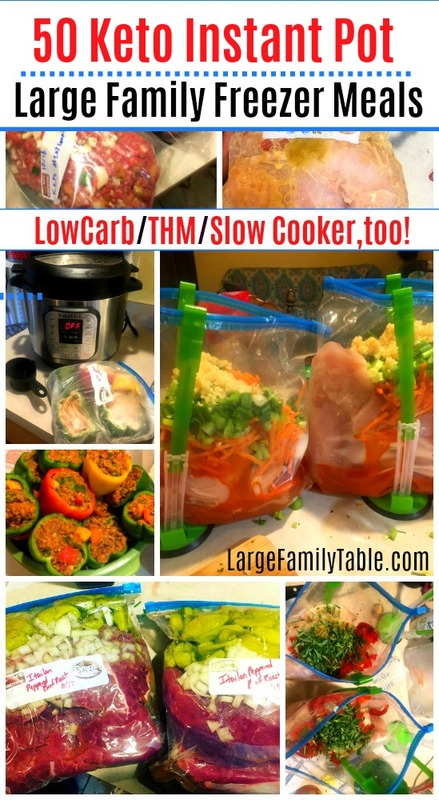 However you may try that Instant Pot freezer meal method and find it works wonderful for you! Spicy Chicken Legs is a simple large family low carb Instant Pot recipe that is perfect for dinner with a twist! Add steamed cauliflower, carrot or celery slices. Directions for each large family freezer meal bag. This recipe makes four-gallon bags (for 4 meals) total. Remove all air from labeled freezer bag and store in your freezer 3 months or more. 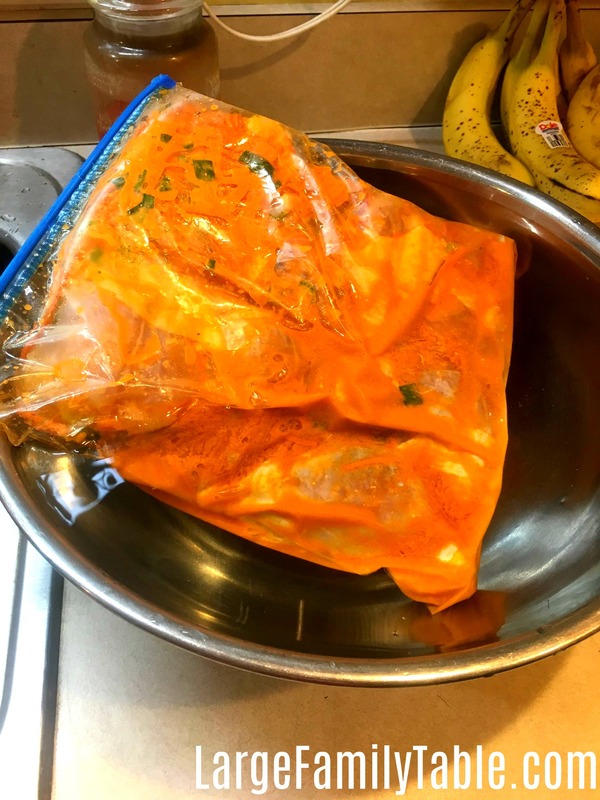 For this Spicy Chicken Leg freezer meal recipe, I needed to do a quick cold water defrost in a bowl of cold water just long enough to be able to get the freezer meal components to dump out of the bag. Dump Spicy Chicken Leg freezer meal into the Instant Pot. Close pressure cooker lid and set pressure valve to seal. Place Instant Pot on manual high for 25 minutes. Let naturally release or safely do a quick release. Once done make sure the internal temperature of your meat reaches at least 165 degrees. The USDA recommends not cooking chicken from frozen in the slow cooker. Because of this set your bag of frozen Spicy Chicken Legs from your freezer into your refrigerator the night before you need to cook it. Place defrost freezer meal in the slow cooker on the cooking day for 7-8 hours on low and up to 4 hours on high. 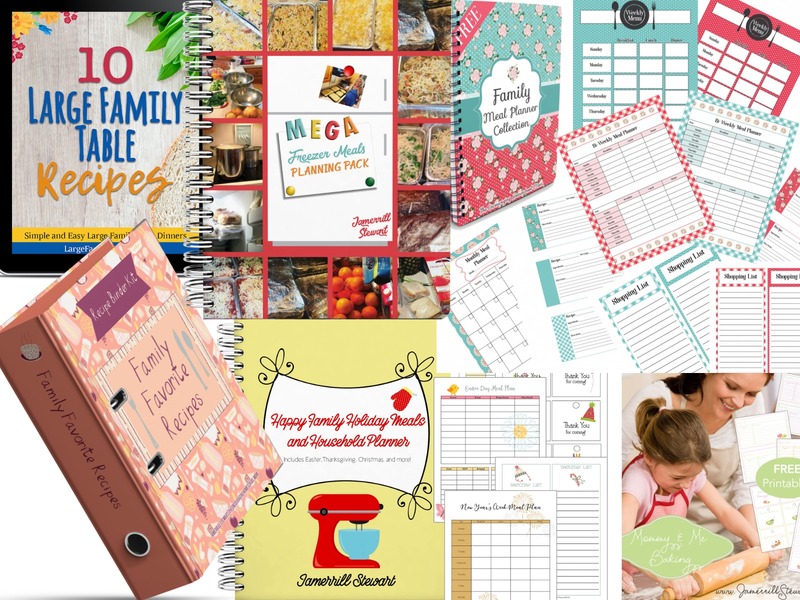 If you love this easy Large Family Instant Pot Recipe you are sure to love these 50 Large Family Keto Instant Pot Freezer Meal Recipes here! FREE LARGE FAMILY FOOD COLLECTION!